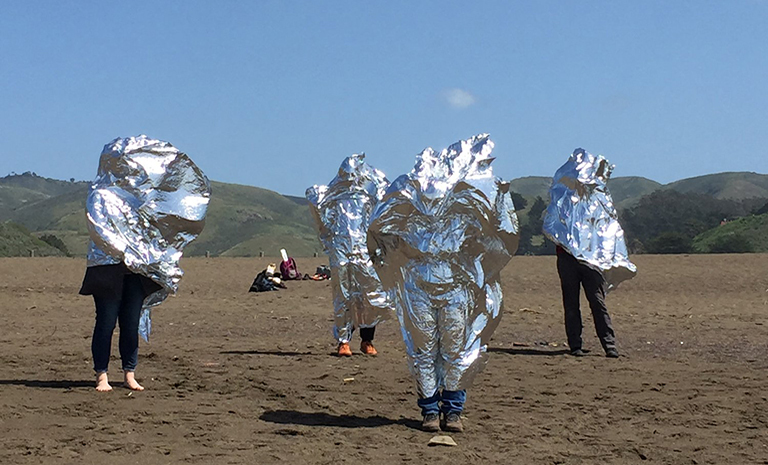 The Body Walk, led by exhibiting artist Minoosh Zomorodinia and artist Astrid Kaemmerling, invites participants to explore the moving body in spaces throughout San Francisco’s Civic Center neighborhood. Through playful activities, both the artists and participants will use their own bodies to navigate places of inclusion and exclusion towards an ultimate goal of defining belonging. This program is planned in conjunction with Part and Parcel, a group exhibition featuring four artists of Iranian descent who consider what it means to belong forty years after the Iranian Revolution. Minoosh Zomorodinia is an Iranian-born interdisciplinary artist who makes visible her emotional and psychological reflections as seen in her mind's eye inspired by nature and her environments. Her work exposes and experiments with humanity's relationship to the natural world. She earned her MFA in New Genres from San Francisco Art Institute, and an MA in Graphic Design and BA in Photography from Azad University in Tehran. She has received several awards and residences including MFA Fellowship from San Francisco Art Institute, Kala Art Institute Media Art Fellowship, and Djerassi Resident Artists Program. She has exhibited locally and internationally. Currently she works and lives in the Bay Area and is Affiliate Artist at Headlands Center for the Arts. Astrid Kaemmerling is a German born artist, scholar and educator based in San Francisco, CA. Her work as interdisciplinary artist spans the genres of visual, performance and media art and strives to connect place memories of the past, such as collected travel experiences, with a critical exploration of specific neighborhoods and selected urban places.